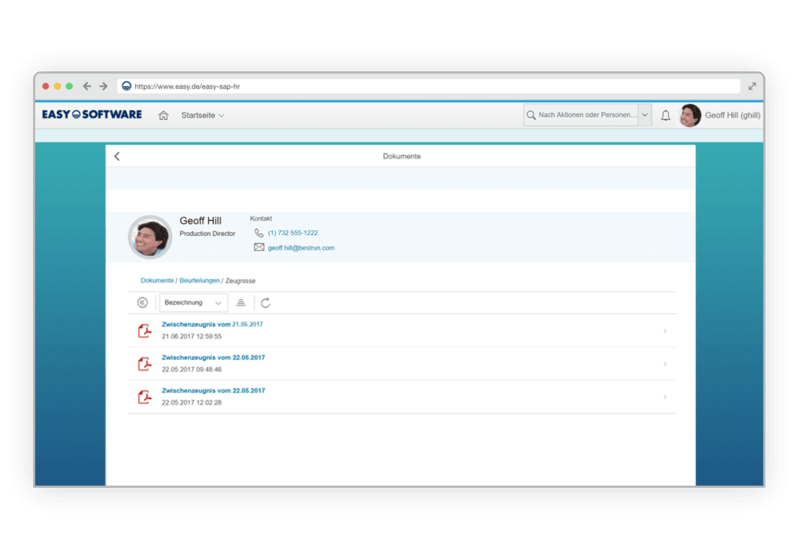 The EASY solution for creating letters of reference optimises the cooperation between the HR department and managers in creating references in SAP® HCM® or SuccessFactors®. Text modules checked in accordance with employment law and a simple user interface available on any device – and with complete integration in your SAP® system – offer the necessary security and speed in the creation of letters of reference. 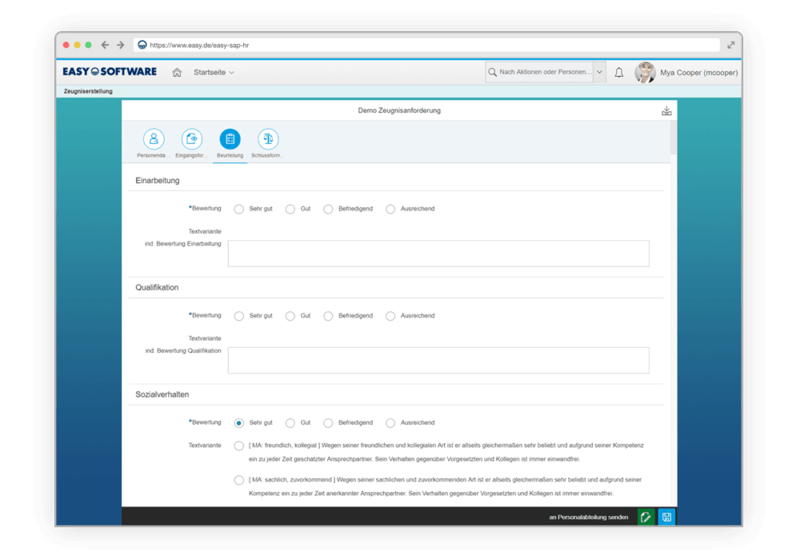 If an employee would like to request a letter of reference – whether it is an interim assessment, an internship reference, or a leaving reference – they start the process quite simply in the Fiori® Launchpad via integrated employee self-services (ESS) or in SuccessFactors® in the employee portal, even via a mobile device. As things proceed, the employee can always view the current status and knows where the reference is at the moment. The HR department receives a notification of a request for the creation of a letter of reference. First, a template is chosen, and then the appropriate text modules are determined by mouse click. Here, the processor is dynamically guided through appropriate options/alternatives based on their selection. Data in the personnel master record from SAP® HCM® or SuccessFactors® are entered directly into the reference template (name, length of employment, etc.). Information directly from SuccessFactors Performance and Goals can be incorporated as an optional enhancement. Letters of reference hold risks when the formulations are not legally compliant. Typically, managers assess their employees, but don’t have the knowledge for the legally correct formulation. The EASY letter of reference creation software solves that problem with legally verified text modules which are kept up to date through regular updates. EASY delivers around 500 text modules which have been verified by a lawyer for employment law. If already existing approval strategies or mechanisms for supervisor location are implemented (using the SuccessFactors Employee Central or the SAP® Organization Management), the supervisor is automatically informed in the next step. The manager can now award grades via an evaluation system. These grades are automatically converted into the legally approved text modules in the background. Digital signature control via SAP® HCM® or SuccessFactors® saves time and prevents media disruptions. The letter of reference doesn’t get “stuck” somewhere because an approval is missing. By the way, managers can also handle all approvals and assessments mobile by smartphone or tablet using SAP® Fiori® or HTML5. The document templates include only the corporate design specifications and the structure of the document (e.g. company name and logo) and are created in Microsoft Word. 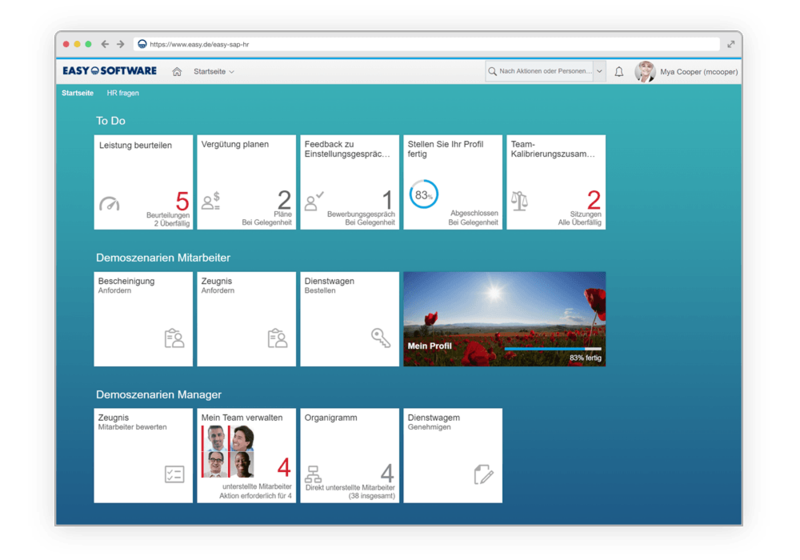 The text modules and text variables and the rules are maintained as independent objects in SAP® and SuccessFactors® and can be changed independently by the department without extensive understanding of SAP®. After the letter of reference is complete, the employee can view and approve it. Then the letter of reference is automatically stored in the correct personnel file. We were looking for software which the HR admins, HR business partners, and mangers could use to create forms and documents, and initiate and monitor processes in their familiar SAP environment. EASY convinced us, because they delivered concrete business content, in this case for creating letters of reference. We were able to get a prototype running very quickly. At the same time, we will also be able to map more business transactions in the future. Writing reference letters is by no means the highlight of the week for HR departments. In this blog post, we show you how to better organize the creation of job references based on SAP. Are you planning on introducing employee self-service? 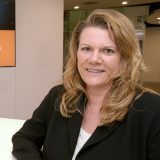 Are you currently in the process of selecting employee self-service systems such as SAP ESS? In this blog post, we introduce you to the most important functions and benefits of employee self-service. We are happy to help you and are at your disposal.